Monticello Main Street, Inc. is a nonprofit organization founded in 1996 by concerned local volunteers dedicated to historic preservation and to strengthening our community's economic growth. The main area of concentration is in the downtown business district, and the extended fringe area of Monticello's downtown. 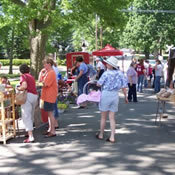 Monticello Main Street also plans events throughout the year like the May Market in May, and the Farmer's Market from June through October, and the Monticello Celebration in the Fall. "To strengthen the vitality of Monticello's Downtown by promoting civic pride, encouraging growth, and preserving and improving community involvement and resources." The Main Street approach is the most efficient and cost-effective approach to preserving the community's identity, social character, and heritage and enhances its viability and quality of life. It gives our community a competitive edge in attracting the kind of quality growth and development we need and seek. It improves business and life in the downtown and affects business throughout the town.